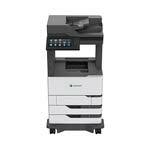 The Lexmark MX822ade Monochrome Laser Multifunction Printer features output up to 55 ppm, long-life imaging components and Ultra High Yield toner capacity. A first page as fast as four seconds sets the stage for high speed printing and copying, backed by the powerful combination of 1.2-GHz quad-core processor and 2GB of memory. Single-pass two-sided scanning at up to 150 spm completes the speed equation, bolstered by bigger-than-ever 200-page document feeder capacity and ultrasonic multifeed detection to help make sure every page gets scanned. Plus, with access to standard input capacity of up to 1200 sheets, replacement toner cartridges that go as high as 55,000 pages, long-life imaging unit and fuser that may never need replacement, you’ll spend more time printing and less time doing maintenance. The MX822ade's standard hard disk enhances overall performance and adds capabilities like OCR, full-speed scanning with mixed originals, image compression, auto detect, blank page removal and a classify-and-route option. And optional finishers that can staple, punch and stack keep big jobs in-house and give even smaller projects a polished and professional look. With a front power button and USB port, 10" class color e-Task touch screen to monitor and configure system settings and single-door access to parts and supplies, it’s easier than ever to get things done. Convenient front access to the paper path means you’ll virtually never have to access the back of the device. And ADA-compliant trays have push-button sliders and open with one hand, requiring low force and no twisting.